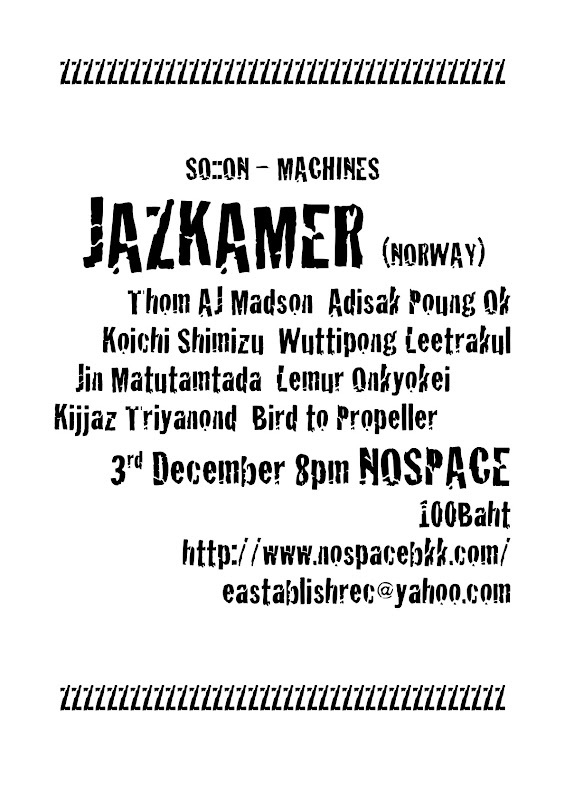 SO::ON will go back to original style experimental/noise showcase featuring Norwegian noise duo Jazkamer and local sound experimetalists. Jazkamer mainmen are Norwegian king of noise, Lasse Marhaug and John Hegre. Both of them have more than 10years career in Norwegian music scene, John as a guitarist, improviser and composer, Lasse as a noise/experimentalist. During their 8 year long existence Jazkamer have explored different kinds of sound expressions and co-operated with different musicians, but the core has always been Marhaug and Hegre. Their first album “Timex” (Rune Grammofon) was part of the avantgarde electronics scene with acts such as Oval and the Mego label. In 2010, they've launch series of album, releasing CD every month. The idea is to keep things exciting all the way, so in keeping with Jazkamer’s eclectic tradition of making very different sounding records, each monthly album will cover the wide (non)musical range Jazkamer has become known for since they started in 1998.